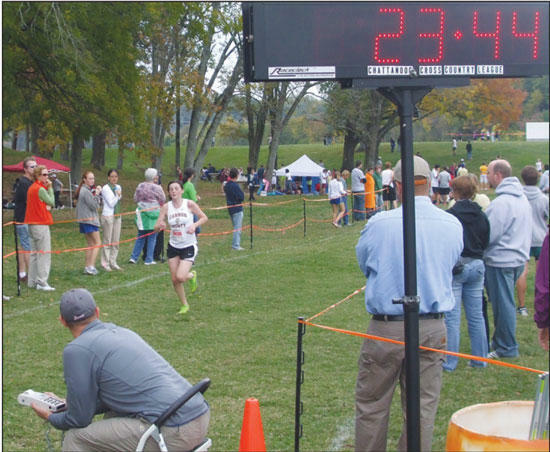 CCHS freshman Hannah Faulkner crosses the finish line in the Region 4A-AA Tournament in Chattanooga. Faulkner finished 10th to earn a spot in the TSSAA State Cross Country Championships. Faulkner, a steady force for the highly-competitive Lionettes all season, qualified for the TSSAA A/AA Girls State Cross Country Championships with a 10th-place finish at the Region 4-A/AA Meet Thursday (Oct. 27). Faulkner turned in a 23:45.23 to finish 10th amongst the field on the challenging 5K course at Chickamauga Dam in Chattanooga. The top 11 runners advance to the state tournament at Steeplechase Course in Nashville Saturday. Faulkner will compete at 10 a.m.
"It is exhilarating to know I am able to run in a state meet as a freshman," Faulkner said. "I never thought I would make it to state this year. I'm hoping to run well and get into the Top 10 (at state) and properly represent Cannon County and the team." While the news was outstanding for Faulkner, there also was heartbreak. Standout sophomore Macy Clements finished 12th and missed the state field by less than one second. The top three teams advanced and Cannon County's team-total 99 was good for fifth, two points behind fourth-place Central Magnet and just 15 points behind the qualifying score turned in by Chattanooga Notre Dame. All three qualifying girls teams were from the Chattanooga area. "(Chickamauga Dam) is in District 8's backyard," CCHS Head Coach Marc Larson said. "The teams from Chattanooga are veteran cross country teams racing on their home court. This is a huge advantage. Until we get more participation out of our district it will be tough to move the region closer to home." Faulkner was ecstatic to qualify for the state tournament, but also was disheartened the entire squad didn't advance. "It is nerve wracking to know they are not going to be there running with me," Faulkner said. "I would have not reached the state tournament without them. I'm excited, and I feel I am representing Cannon County and all of the team. I just really wish they were there with me to run." Cannon County's boys, led by Clay Luker, finished eighth overall in their first year of competition. The Lions' chances for a higher finish were dampened when top runner Jordan Turney experienced illness and could not continue the race. Turney was outstanding all season and a consistent performer for the Lions. The Lionettes' consistency all season was a strong suit and it was on display in the region meet. Behind Faulkner and Clements, were outstanding showings from Madison Walkup, Lauran Simmons, Sara Hickman, Katie Hickman and Lauren Turney. "I'm proud of all the runners," Larson said. "Both teams have blown past all my expectations this year. They are a tough group who have bought in to running as a lifestyle as well as a sport." "I am happy for Hannah. She is a great runner to represent the toughness of this team." Walkup was 24th overall with a 25:40.40, and Simmons finished in succession, crossing the line 26th through 29th, respectively. Simmons (26:00.30) was 26th, followed by Sara Hickman 926:01.30), Katie Hickman (26:02.87 and Lauren Turney (26:05.54). Faulkner said her success and improvement throughout the season was due to strong coaches, teammates and work ethic. Reaching the highest level of her sport at the state level as a freshman is a plus. "Being able to have this sport was important to a lot of people this year," Faulkner said. "There are people who may not play basketball, volleyball, softball or something, but cross country is for anyone; you just have to have a passion for running." Luker was 29th overall for the Cannon County boys, followed by T.J. Paul (41, 22:29.86), Wesly Alexander (44, 22:43.07), Mathew Turney (46, 23:03.42), Will Bailey (47, 23:07.41) and Jason Garcia (55, 23:36.73). What an awesome 1st season for the CCCHS Cross Country Team! Thanks Coach Larson and Coach Elrod for beleiving in our children and making them the best!